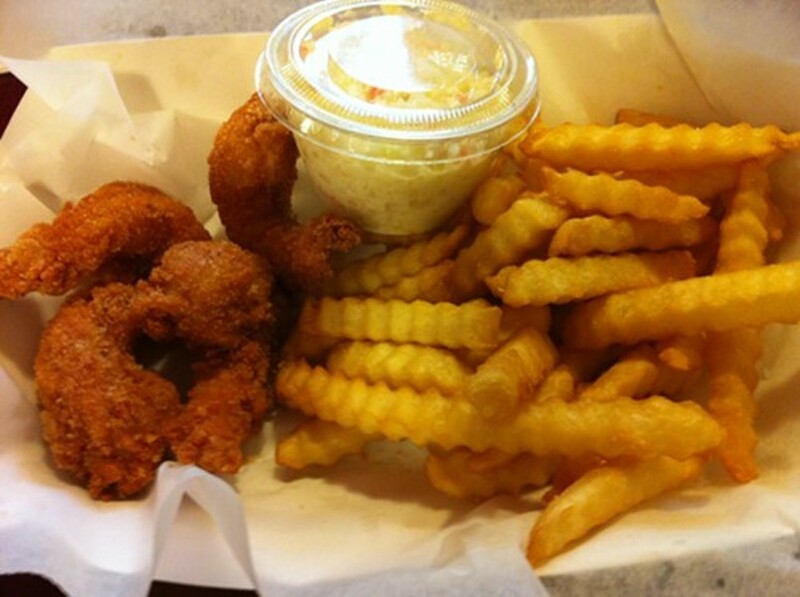 "Know the difference, taste the difference," is the motto at Snappy's Shrimp House, the difference being that Snappy's serves only Gulf shrimp, not the flavorless, dinky farm-raised kind. Items are sold by weight, a la carte; add $2.50, and you get fries, coleslaw, and a soda. The only bad news is that a quarter pound of shrimp is only four shrimp. Still, they're nice and big, and I actually found myself peeling off the breading so I could enjoy the simple, sweet taste and seafood snap of the shrimp themselves. And since everything was cheap, my dining companions and I really went for it and also got a quarter pound of the fried catfish strips ($2.50), a quarter pound of the fish chips ($2.25—and really, they were more like fish nuggets), a side of clam strips ($2.25), and an order of hush puppies (ten for $2, and they come with honey butter). We're all former Floridians, and none of us was overwhelmed—we're spoiled when it comes to freshly caught fish—but we agreed that here you'll find perfectly enjoyable fried foods at a good price.